Minor League Baseball and BUSH's Beans announced on Tuesday that the Dunedin Blue Jays were the top contributing team in the "Team Up Against Hunger" July food drive initiative. 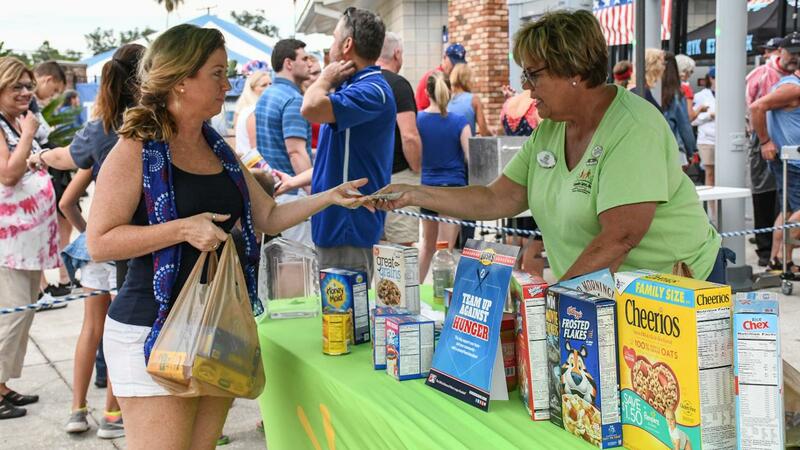 Blue Jays fans donated 1,126 pounds of non-perishable food items at Dunedin's annual Hometown USA celebration, the largest donation of nearly 80 participating Minor League teams from across the country. In recognition of the generosity of Dunedin fans, BUSH's Beans and MiLB Charities will match the Blue Jays' donation to the Dunedin Cares, Inc. Food Pantry to help local families in need in Pinellas County. Over five tons of food was collected during the 2018 food drive throughout the Minor Leagues, which will help provide over 9,000 meals to families in need in 35 states. The food items donated by Blue Jays fans and the matching donation from BUSH's Beans/MiLB Charities will go to Dunedin Cares, Inc., a local food pantry that has distributed over 85,000 pounds of food to over 6,500 local residents since 2015. Blue Jays staff, mascot DJay, and players Riley Adams and Connor Eller visited the Dunedin Cares, Inc. Food Pantry to deliver the team's donation and help sort and distribute the food to local families in late July. At the Blue Jays July 3rd Hometown USA event, $595 was raised for Dunedin Cares through an in-game 50/50 raffle in addition to the donation of non-perishable food items.